Interfaith Emergency Services has been gifted a beautiful 2011 Cadillac SRX and we want to give it away! This car has been garage-kept, is in excellent condition and only has 65,000 miles. On February 14th we will draw the winning ticket at our Legacies of Love luncheon at the Ocala Hilton. If you are over 18 years of age you can enter the drawing with a $100 donation. Donate more for multiple chances to win! Tickets can be acquired at the IES main campus located at 435 NW 2nd Street or at our Center for Life at 108 N. Pine Avenue, in Ocala. You might also keep an eye out for our CEO, Karla Grimsley, who will be out and about accepting donations for tickets. We welcome everyone to come and celebrate our honorees on February 14th but you do not have to be present to win. 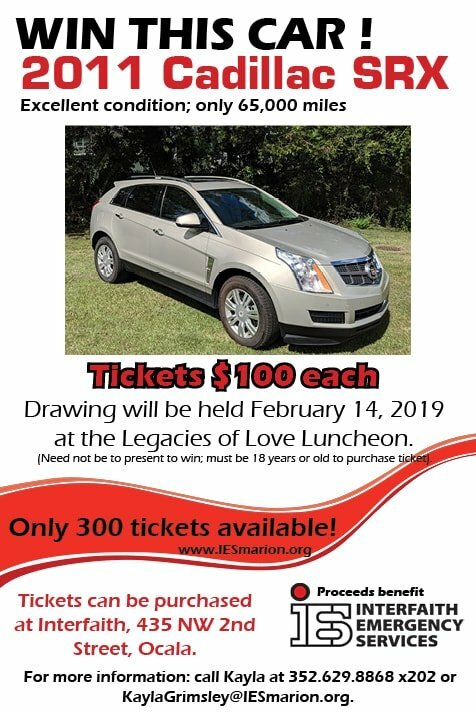 For more information about the chance drawing to win the Cadillac SRX or about attending the Legacies of Love contact Kayla at 352-629-8868 ext. 202 or at Kayla@iesmarion.org All proceeds will go to support the ministry of Interfaith as we assist those in need throughout our community.